Phoebe Burgess pregnant interview: She was sick at Fashion Week. 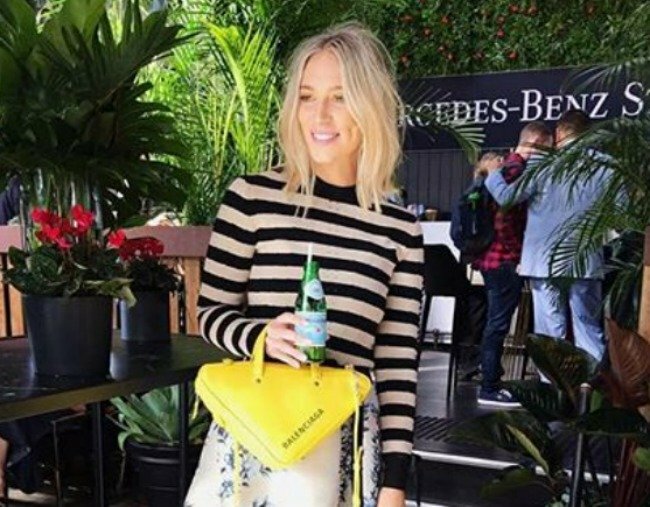 How a sick Phoebe Burgess managed to hide her second pregnancy at Fashion Week. Yesterday it was revealed Phoebe Burgess is pregnant with her second child. The 29-year-old is already mum to a 17-month-old daughter, Poppy, with her husband, football star Sam Burgess, 29, and while she says they’re overwhelmingly “excited” to be growing their family, she admits they’re probably a little bit “mad” too, given the close age gap between kids. “It is awesome. We’re honestly over the moon,” she tells Mamamia. But while the secret is out now, Phoebe admits it was tricky keeping her pregnancy under wraps for as long as she did – especially in the early stages, because she was so sick. “I get my sickness in the evening, but to be honest, I was sick all day with this one,” she says. Still, Phoebe somehow managed to push through it, putting in several glamorous appearances at Fashion Week in Sydney last month. And while the rest of us where none the wiser to the fact she was with child, Phoebe says she actually felt kind of awful. “I was pretty sick at the time,” she admits. She says she also strategically planned her outfits so people wouldn’t detect her burgeoning baby bump. “I think I got pretty good at blazers and shirts,” she adds. Although it is her second pregnancy, Phoebe says this experience has been totally different to the one she had when she was pregnant with Poppy, and admits it’s been a lot harder this time around. “Pregnancy – I thought I sort of had it nailed after the first one, but they’re all different,” she admits. She thinks being mum to an active toddler has also made things that much harder this time around. “This one’s been pretty challenging… [With] my first pregnancy, I was able to take rest,” she says. But after a difficult few months, Phoebe says she’s finally starting to feel like her old self again. “I was just tired to my bones, but my energy is slowing coming back, which is awesome,” she adds. Now, the journalist is trying to raise awareness of Vitamin D deficiencies, particularly in pregnant women. 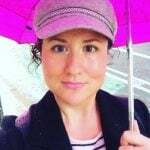 Although it didn’t affect her personally, research by Ostelin shows that 70 percent of all pregnant women in Australia are Vitamin D deficient. “Vitamin D deficiency is something that we associate with ageing, so that statistic really shocked me. It really threw me, so it was something that I thought was a conversation that all mums should start having,” she says. She’s also enjoying finally sharing her pregnancy news with the world. “We were really enjoying having these 14 weeks to ourselves and to our family and friends, and it’s a fun thing to share with everyone now,” she says. Although the couple wasn’t “actively trying” for a baby, Phoebe says it was definitely on their radar. “We were in the game. We were excited about having another baby. But I think after a while, you just get back to normal life. It’s always a surprise when you find out you’re pregnant,” she adds. And no one was more surprised than Sam, apparently. “He was so excited!” she says. “He came back from the shops, and he said he’d bought me a present. I think it was a croissant… I said, ‘I got you a present, too,’ and we counted to three, and I gave him the pregnancy test. He hit the roof! He said, ‘No way!’ about 10 times.